Providing a concise and accessible introduction to the work of the celebrated twentieth century German philosopher, Hans-Georg Gadamer, this book focuses on the aspects of Gadamer’s philosophy that have been the most influential among architects, educators in architecture, and architectural theorists. Gadamer’s philosophy of art gives a special place to the activity of "play" as it occurs in artistic creation. His reflections on meaning and symbolism in art draw upon his teacher, Martin Heidegger, while moving Heidegger’s thought in new directions. His theory of interpretation, or "philosophical hermeneutics," offers profound ways to understand the influence of the past upon the present and to appropriate cultural history in ever new forms. 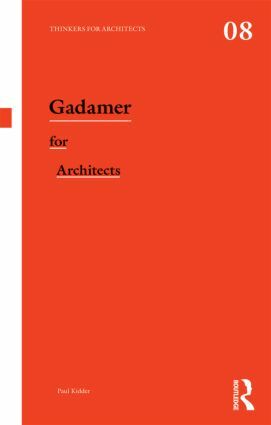 For architects, architectural theorists, architectural historians, and students in these fields, Gadamer’s thought opens a world of possibilities for understanding how building today can be rich with human meaning, relating to architecture’s history in ways that do not merely repeat nor repudiate that history. In addition, Gadamer’s sensitivity to the importance of practical thinking – to the way that theory arises out of practice – gives his thought a remarkable usefulness in the everyday work of professional life.